Our office has decades of experience in successfully managing this condition with a variety of custom contact lenses. 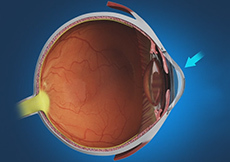 In recent years, scleral contact lenses have become the lens of choice for most patients due to their excellent safety profile, superior comfort and vision restoration. Many patients are referred to us by other optometrists and ophthalmologists due to our experience and positive results in managing this condition. Together with fellowship-trained corneal specialists, we are also able to guide you through other new procedures such as Collagen Cross Linking in order to stabilize the condition and prevent the need for a potential future corneal transplant surgery. Please call us at to schedule a complimentary keratoconus consultation to see what your options are. 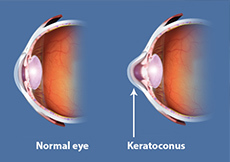 We can help almost everyone with a diagnosis of keratoconus.